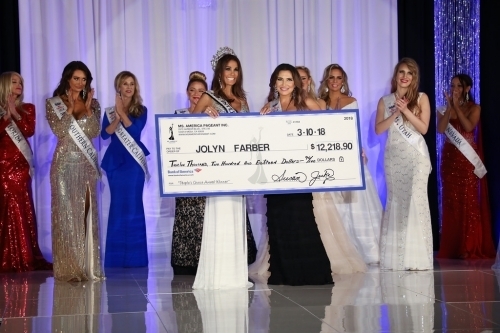 Ms. International 2018-19 - Jolyn Farber also won the Peoples Choice award and won $12,218.90 CASH! Ms. International 2017 - Nova Kopp also won the Poeple's Choice Award! She won $12,500.00 Cash! Ms. America is for women 26 years of age and up who are single, divorced, widowed or married. 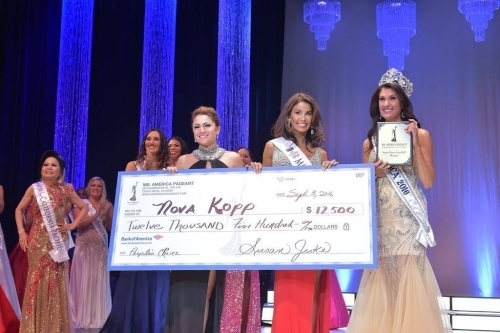 Competition is based on Evening Gown, Interview, Sportswear and On-Stage Question. Photo Shoot with Official Ms. America ® Photographer. Promotion on Ms. America ® Pageant website. Opportunity to represent the United States in International Competitions if she qualifies. Round trip airfare to the Ms. America ® Pageant (not to exceed $500.). Ms. America ® Pageant hotel accommodations if she lives outside of the area. Complimentary copies of the program books. Complimentary tickets (4 tickets) for the Ms. America ® Pageant. Winner receives two (2) farewell color ad pages for the program book. 7 Day - 6 night 1200 square foot guest house accommodations (King size bed) with a 7 day car rental (compact car) in Orange County, CA. Must be used during national titleholders reign. Date to be mutally agreed upon. Not Mandatory: Ms. America ® will have the opportunity to qualify and be awarded the prestigious Presidential Award. Award includes a certificate, pin or medallion. Frame not included. This prestigious award was created by the President of the United States and implemented by the Presidents Counsel in the White House. Awarded to titleholder on stage when she returns to crown her successor. Every titleholder so far has received this award for her Year of Service. Winner and contestants are responsible for all costs (shipping, extra baggage fees, etc.) associated with the transportation of all prizes from the pageant to her home. This prestigious title is for women who are 40 years of age and up - single, divorced, widowed or married. Competition is based on Evening Gown, Interview, Sportswear and On-Stage Question. Photo Shoot with Official Photographer. Hotel Accommodations shared with Ms. International winner at National Pageant. Not Mandatory: Ms. America International ® will have the opportunity to qualify and be awarded the prestigious Presidential Award. Award includes a letter from the President of the United States, certificate and pin. Frame not included. This prestigious award was created by the President of the United States and implemented by the Presidents Counsel in the White House. Awarded to titleholder on stage when she returns to crown her successor. Every titleholder so far has received this award for her Year of Service. MS. INTERNATIONAL ™- Optional Award - Not mandatory! This prestigious title must not only represent the pageant but also the fans! Therefore we allow the people to vote for their favorite contestant and combine that with her over all Judges Competition Scores along with Ad Sales and the Peoples Vote. The contestant who receives the most combined points will earn this world renowned title and be crowned Ms. International! Contestant received a perfect score in all categories from the judges = 100 points. Contestant sold one (1) B&W Full Page Ad for $400. = 400 points. People Voted 300 times for Contestant at $1 per vote = 300 points. Total Score Is: 800 points. Photo Shoot with Official Ms. America® Pageant Inc. Photographer. Hotel Accommodations shared with Ms. America® International winner at National Pageant. Complimentary tickets (4 tickets) to the Ms. America® Pageant Inc.
Ms. International™ will have the opportunity to qualify and be awarded the prestigious Presidential Award. Award includes a letter from the President of the United States, certificate and pin. Frame not included. This prestigious award was created by the President of the United States and implemented by the Presidents Counsel in the White House. 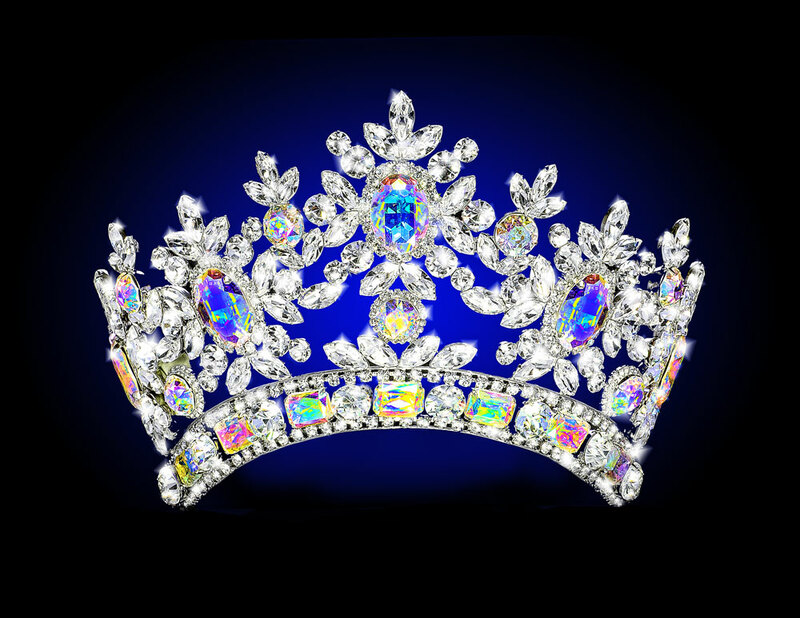 Awarded to titleholder on stage when she returns to crown her successor. Every titleholder so far has received this award for her Year of Service. Winner is responsible for all costs (shipping, extra baggage fees, etc.) associated with the transportation of all prizes from the pageant to her home. This prestigious title is for women who are 50 years of age and up - single, divorced, widowed or married. Competition is based on Evening Gown, Interview, Sportswear and On-Stage Question. Hotel Accommodations shared with a national winner at National Pageant. Not Mandatory: Ms. America® Elite will have the opportunity to qualify and be awarded the prestigious Presidential Award. Award includes a letter from the President of the United States, certificate and pin. Frame not included. This prestigious award was created by the President of the United States and implemented by the Presidents Counsel in the White House. 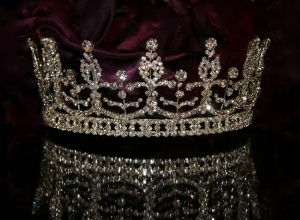 Awarded to titleholder on stage when she returns to crown her successor. Every titleholder so far has received this award for her Year of Service. $300. discount to the following National Pageant if eligible to compete. (May not be combined with any other discounts or early bird specials). First choice for a State or Regional Title if she is returning to next years pageant. $200. discount to the following National Pageant if eligible to compete. (May not be combined with any other discounts or early bird specials). Contestants have added these impressive awards to bio's, resumes, websites, blogs and on-stage introductions! This award is given to a contestant who has overcome a challenge in her life which enabled her to believe in herself again. To apply for this award contestant must write a statement of not more than 500 words describing the challenge and what she did to become victorious. Contestant must submit in writing how becoming a state or regional titleholder has changed her life. To apply for this award contestant must write a statement of not more than 500 words. This award goes to the contestant who is able to use her title for a purpose to "make a difference". To apply for this award contestant must write a statement of not more than 500 words. Included in the media attention also shows or talks about how one can reach Ms. America® Pageant will be taken into consideration for this award. This award is given to the contestant who has made the most appearances before the national pageant. Requires documentation using Queen Corner. Ms. America® must be able to show charm and personality through anything she does. Judging criteria is based on expression, poise, photogenic projection, and personality displayed through portrait and portrayed confidence. Submitted photo for the program book is taken into consideration as well as how she photographs throughout the competition. Official photographer of the Pageant will choose the winner. The Ms. Congeniality Award is a coveted title at the Ms. America® Pageant. Contestants will have the opportunity to vote for the woman who they feel personifies the true Spirit of Pageantry and is someone who is friendly, helpful, genuine, outgoing and has the most positive attitude throughout the pageant. The Ms. America® Pageant will recognize sustained commitment to volunteer service and civic participation. She has served her community in a lasting and meaningful way. To apply for this award contestant must write a statement of not more than 500 words describing the service project(s) and her philosophy of community service. Own A Piece Of History…. Create A Legacy! Every Contestant Receives This Crown Along With A Embroidered Satin Sash And Title Representing Her Area! Experience the glamour and allure of one of the most majestic tiaras from the British Monarchy! Our exclusive “Royal Inspiration” crown is a striking replica of Her Majesty Queen Elizabeth’s tiara known as the “Girls of Great Britain and Ireland”. In 1893 the tiara was given to the future Queen Mary as a wedding gift when she married the future King George V. The diamond tiara was purchased from Garrard, the London Jeweler by a committee headed by Lady Eve Greville who raised more than 5000 pounds. The surplus monies were given to a charity fund, on Queen Mary's own request, benefiting the widows and orphans of men lost at sea during the sinking of the HMS Victoria. Later Queen Mary replaced the pearl finials with diamonds and removed the bandeau from the base so it could be worn as a headband. When Queen Elizabeth II married Prince Philip in 1947, Queen Mary gave the tiara to her as a wedding gift. In 1967, the bandeau was reunited with the tiara. 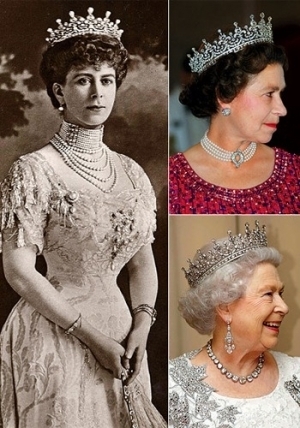 Today, the tiara is a favorite piece of jewelry and is worn prominently by Queen Elizabeth II at state occasions and appears on commonwealth stamps and currencies. 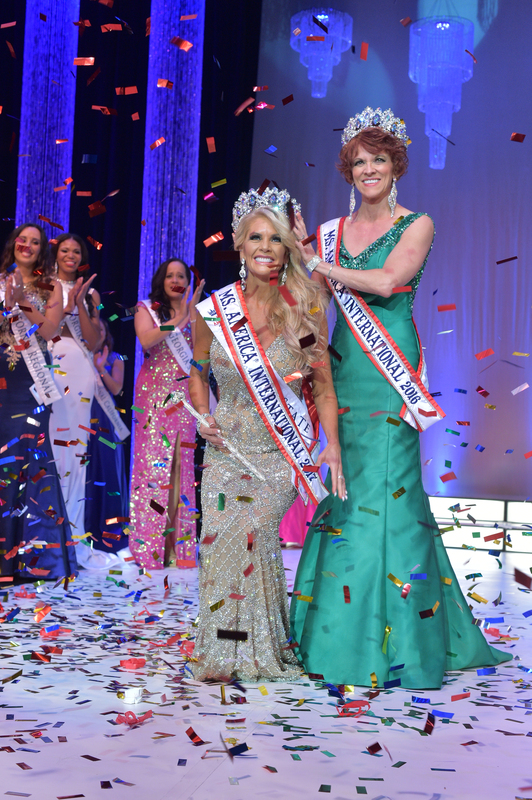 In the spirit of this historic tiara, the Ms. America® Pageant commissioned an updated full circle replica crown that is made with Austrian Crystals and Silver Plated. Surround yourself with glamour with this exclusive masterpiece! Become A State or Regional Titleholder And Make A Statement At Your Appearances Wearing This Exclusive Queen Elizabeth's II Replica Crown!